This rock was gathered just a few miles from home. It's known locally, along with other river rock, as "Brookwood Stone." In Chilton County, the composition of the gravels is 10% chert and 90% Quartz. 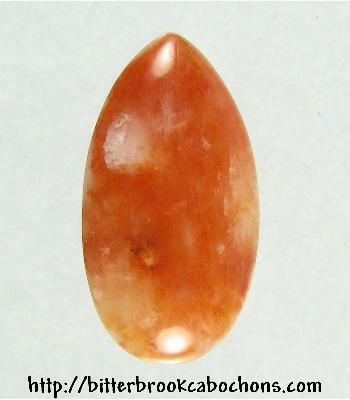 This cabochon is mostly red, with a milky cloud with chatoyance and two tiny vugs towards the top. 32mm x 17mm x 5mm. Weight: 23.00 carats. Do you like Brookwood Stone Cabochons? Click here to see all of the Brookwood Stone Cabochons on the site!